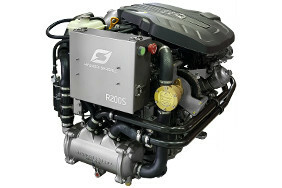 The R200 features a strong cast iron cylinder block mated to a light-weight aluminum 16 valve cylinder head. Service-friendly features include a reusable air filter, colour coded service points, water-in-fuel alarm, easily accessible seawater pump, one-button used oil drain system and easily replaced engine anodes. At the core of Hyundai Seasall's Advanced diesel technology is a focus on stability, performance, fuel efficiency and reliability: key elements which make their engines world class. Hyundai Powertrain Technology, already proven in a full range of modern diesel engines, now brings this exceptional performance and reliability to the marine market. The designs optimize fuel injection and intake porting to improve combustion performance, particularly low-temperature combustion stability though lean air-fuel rationing. This ensures that we satisfy the world’s strictest exhaust emission standards while providing the smooth, quiet and efficient power for which Hyundai SeasAll is becoming known. Solenoid Common Rail Direct Injection System(CRDi) delivers 200hp and 44kg•m of torque from the 2.2 liter In-line 4 CRDI engine. The common rail multiple injection features make the In-line 4 R-series more environmentally friendly by minimizing the emissions of particulates and NOX.